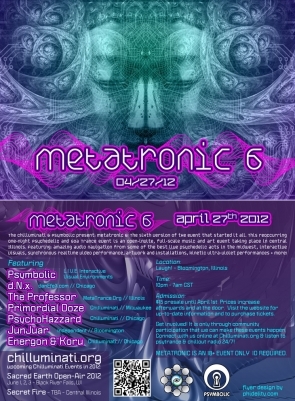 The Chilluminati & Psymbolic present: Metatronic 6! The sixth version of the event that started it all. This reoccurring one-night Psychedelic and Goa Trance event is an open-invite, full-scale music and art event taking place in Central Illinois. Featuring: amazing audio navigation from some of the best live psychedelic acts in the Midwest, artwork and installations, kinetic ultra-violet performances + more! Ticket prices are currently $15 and will automatically increase over time. purchase Metatronic 6 tickets sooner than later for Best prices! -This venue is strictly 18+ with a valid driver’s license. Metatronic will begin at 10PM (with a target end time of 7AM) Come Early, Stay Late! -Become part of the community. Help the planet and help us. Pick up after yourself. Leave the site (and our reputation as a community) better than you found it. -Please do not park on the street. The parking enforcement in the area is very unclear, and while you won’t get towed for parking on the street, you might get a parking ticket. There are 3 parking garages nearby on Market St, Monroe St, and Front St. All are just a few blocks from the venue, and have free overnight parking. Use those to be Safe. -Ins and Outs are allowed. There are several bars and restaurants nearby, as well as our favorite Hookah bar, The Smoker’s Den, which is one block away. There is also one of our favorite pizza/pasta joints right next door, Lucca Grille. Although leaving and re-entry is allowed, we do ask that you make every effort to come prepared to stay. -We ask that you do not arrive before 10PM for Metatronic. There will be no general admission between 8PM and 9:30PM. This is to minimize incoming traffic to the venue and to be respectful to the show beforehand. -The event @ Laugh before Metatronic is a 21+ show only, and there will be no underage admission until after that has wrapped up. This is a stipulation that we have agreed to with the City of Bloomington in order to have Metatronic be an 18+ event, and it will be strictly enforced. -We can always use help with setup. Please contact us directly if you’d like to come out for early setup.